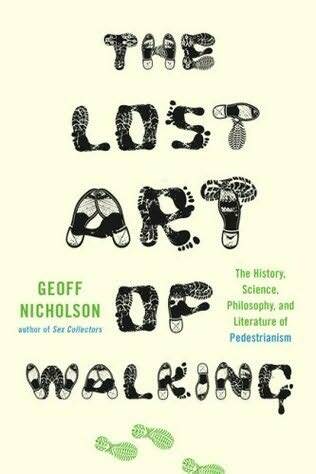 Geoff Nicholson’s The Lost Art of Walking: The History, Science, Philosophy, and Literature of Pedestrianism is one of three recent general surveys of walking (the others are Rebecca Solnit’s Wanderlust, which I’ve written about here, and Joseph Amato’s On Foot: A History of Walking, which I haven’t read). Nicholson is an urban walker, a stroller; he finds that he has to walk to keep a recurring depression at bay. That’s difficult, though, because he lives, at least some of the time, in Los Angeles, hardly a pedestrian-friendly environment. But he manages to walk there, despite the obstacles. Much of his first two chapters are taken up with stories about various walks in southern California; he also writes about walking in London, where he lives when he’s not in L.A., and New York. But The Lost Art of Walking isn’t really a book about Nicholson’s own walks–not entirely, anyway. It is, as its subtitle suggests, a book about walking in general. There are discussions of the physiological effects of walking, of walking in Raymond Chandler’s writing, of the artist Richard Long (whose work is based in his practice of walking) and of Captain Robert Barclay Allardice, a Scotsman who walked a thousand miles in a thousand hours to win a bet. Nicholson writes about the English writer Sebastian Snow, who walked 8,700 miles from Tierra del Fuego to the Panama Canal, and about Iain Sinclair, a writer whose books about walking in London have been his biggest commercial successes. He talks about characters who walk, or who have distinctive walks, in the movies. He goes to a conference on psychogeography, a supposedly playful way of exploring cities on foot that was invented by the French philosopher Guy Debord, the leader of the Situationist International group, and is disappointed when the attendees don’t do much walking. He considers religious walking practices and street photographers (who must, almost by definition, spend a lot of time walking around on city sidewalks), and songs about walking. He returns to Sheffield, where he grew up, and walks around. And so on. “And so on.” That feels like a damning dismissal, and in a way it is. Nicholson has done a lot of research and he’s an able prose stylist, but there’s something about this book that I didn’t enjoy. Maybe it’s the sense of skimming, of piling topic after topic onto the discussion. Maybe it’s the fact that he clearly doesn’t like or respect Rebecca Solnit’s book on the subject, which is, I think, more deeply thought and felt than Nicholson’s. Maybe it’s just Nicholson himself, who comes across as a little self-satisfied. I don’t know. I liked parts of The Lost Art of Walking–the discussion of Richard Long in particular–and I’m going to make use of Nicholson’s bibliography, but it’s not my favourite book on this topic.